GSM Signal AnalyserPowerful GSM Network Signal Analyser – Quad BandA handheld instrument powered by internal rechargeablelithium cells for GSM site surveysand installation engineers. • Powered by internal lithium batteries and internalintelligent charger. This new GSM Signal Analyser performs an on-air cell survey, interrogating all cells it finds to identify the network and signal strength. It does this via its own antenna so the user can roam to find a good location, or via any antenna connected to the analyser’s SMA connector – so testing can be undertaken from an installed antenna. Cell analysis is network independent – no SIM card is required. Once it completes a survey it displays the strongest signal strength in dBm and network name for each network found on the built in liquid crystal display*. The membrane keypad allows scrolling through the results, and easy selection of test criteria via a simple menu structure. LEDs show the unit’s charge status, network status and test progress. 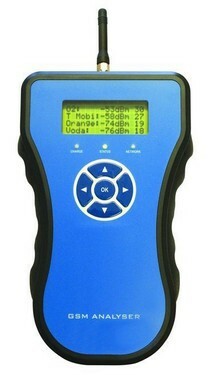 The analyser can also display the standard signal strength from installed GSM modems by connection through a serial port, allowing complete modem-SIM-antenna testing in situ. The network list that the analyser searches for can be customised to the country where testing is performed, and limited to selected networks only. The analyser is connected to a PC via the built in serial port and the optional configuration tool is used to control the search criteria. This also allows test results to be logged to the PC, and other user specific configuration. The ASLH359 uses an internal microprocessor and ASLH’s proprietary GSM technology to provide unrivalled functionality in a handheld tester. The Analyser is powered by internal rechargeable lithium cells, charged via the inbuilt intelligent charge circuitry. The ASLH359 can be charged from a vehicle cigar lighter socket or any ASLH approved power source. and all appropriate worldwide specifications.